COLUMBUS, OH--(Marketwire - January 26, 2011) - A diverse group of private sector and government researchers in various R&D activities worldwide cite constricted budgets as the most critical challenge facing the global scientific community, with more U.S. than non-U.S. researchers believing they would be impacted. 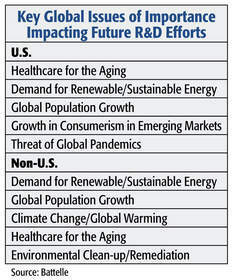 In an annual Global R&D Funding Forecast, Battelle and R&D Magazine polled 378 respondents, ranging from CEOs to laboratory analysts, from 38 different countries. The poll, which is the first of its kind, is part of an annual forecast that also revealed China is now second only to the United States in R&D funding and is benefitting greatly from an unprecedented investment in education. Researchers in the U.S. are more concerned about budget pressures than the non-U.S. researchers, with 41 percent of U.S. respondents citing in it as a critical challenge versus 33 percent of the non-U.S. respondents. While there was some agreement on certain issues in this area, there were marked differences between U.S. and non-U.S. researchers. U.S. researchers, perhaps reflecting both a market orientation and a significant bio-medical representation in the respondent set, elevated both "growth in consumerism in emerging markets" and "threat of global pandemics" to their top five concerns. Non-U.S. respondents, perhaps reflecting a larger environmental industry presence among them, included "climate change/global warming" and "environmental clean-up and remediation" in their top five. A key finding of the closely watched Global Funding Forecast finds that Asia's stake in R&D spending continues to increase, a shift begun more than five years ago. The U.S., however, still dominates absolute spending at a level well above its share of global Gross Domestic Product. 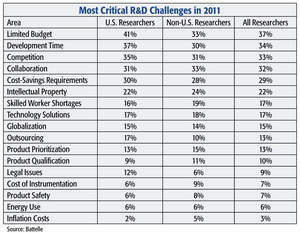 During the recession, the Asian R&D communities generally, and China specifically, increased R&D investment and stature. China entered the recession with a decade of strong economic growth. During that time, it increased R&D spending roughly 10 percent each year -- a pace it maintained during the 2008-2009 recession. This sustained commitment set China apart from many other nations. As the world's largest, independent research and development organization, Battelle provides innovative solutions to the world's most pressing needs through its four global businesses: Laboratory Management; National Security; Health and Life Sciences; and Energy, Environment and Material Sciences. It advances scientific discovery and application by conducting $6.5 billion in global R&D annually through contract research, laboratory management and technology commercialization. Headquartered in Columbus, Ohio, Battelle oversees 22,000 employees in more than 130 locations worldwide, including seven national laboratories which Battelle manages or co-manages for the U.S. Department of Energy and the U.S. Department of Homeland Security and a nuclear energy lab in the United Kingdom.